This runner has been upgraded to the NEW Movento S. One solution for three technologies, BLUMOTION, TIP-ON BLUMOTION or SERVO-DRIVE. Click here to view the new line of Runners. MOVENTO offers a synchronised feather-light glide, 4-dimensional front adjustment, dynamic carrying capacities of 40 and 60 kg, high stability and very good sag values. 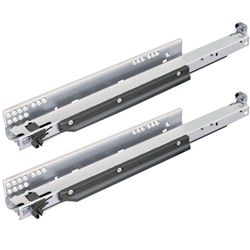 MOVENTO can be combined with the SERVO-DRIVE electrical motion support system for handle-less fronts. Furniture opens with just a light touch and closes silently and effortlessly thanks to BLUMOTION. If a mechanical opening support system is required, MOVENTO is available with TIP-ON BLUMOTION or integrated TIP-ON technology.